He never took his eyes off of her, the whole entire rest of the ceremony. The Captains Court went on for hours, she was the last person called. And when she was, it was, what you could say, a little bit more than nerve racking. "Captain Meathil and her bracket please step fourth." 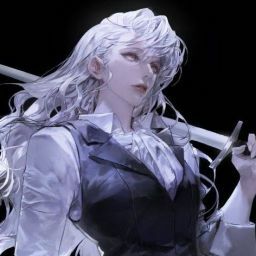 They did just that, in a nice orderly fashion she and Eglanor lead the bracket out to the middle of the room and faced the queen, who just as intimidating as she remembered. "Captain please present your vice-captain and informant." "Yes your highness, Eglanor, Othes," She called, her informant and vice-captain stepped forward and stopped when reaching her. "Eglanor is my informant, he is sixteen. And Othes is my vice-captain she is eighteen." "Ah, perfect ages to get along with you isn&apos;t that right Meathil, since you are only sixteen yourself. I believe you are the youngest captain here, that must say something right?" "I don&apos;t know what you are implying my queen," she answered even though she knew perfectly well what the woman was saying. "I just mean you must be very powerful and special to be crowned so early, that&apos;s all. Thank you captain, you may return back to your original waiting spot." "Thank you your highness," she moved her bracket back to they&apos;re original spot and waited for further instructions. The whole time she was so nervous, every time she looked into the queens eyes she felt a shiver down her spine. Although the queen was beautiful and kind, she was also incredibly powerful. There was a reason she was the queen of the whole realm of Venus. "Now that everyone has been checked up on, I would like to bring an urgent matter up for discussion. The Ostwyns have been acting up lately, and I have heard rumor the Shadowmounts have been too. Do any present captains have any information about either race, it would be helpful please," the queen asked. She looked around, but no one said anything. The races, there was the original Venus like herself, who looked normal, meaning no wings or anything. Then there was the race of the Valoor, they were considered to be built for war. The Valoor was a race of the species Venus, and in the Venus realm. But the Valoor had heightened hearing with long pointed ears, and they were much taller than the average. The women of Valoor usually were around 6&apos; when fully grown, and the men 6&apos;10". After that there was the Eriness, this race was the most similar to the Venus race, the only difference between them was the Eriness race had better noses. They could sniff out anything within a 40 mile radius. One of the races the queen brought up was the Shadowmounts, this was an interesting race, many powerful mages came from Shadowmount. Shadowmount&apos;s Venus had large wings, possessed magic, and could read the souls of others. They were an extremely rare and dangerous race to come across. Even though they are that powerful, they use dark magic, that is the only type of magic they practice. This race possess the ability to bend darkness to their wills, and they are the most corrupt race out of them all. The last race was the Ostwyn&apos;s, they had a particular look to them. This race had a dragon like tail, with long talons on their hands. The Ostywn&apos;s got to choose when they wanted to have their extra attributes but, they often didn&apos;t mind showing of their frightening true form. This was the most fearsome looking race, even though they weren&apos;t nearly as powerful as the Shadowmounts, they were still hell of a scary. The Valoor were known for dispatching the most well trained, and well fitted Venus for battle. They were the best at training warriors, that was their races specialty. The specialty of the Eriness race was archery, they had the most precise and well trained archers in all of Venus. The original Venus, herself, were known for their massive connection to light magic, they were able to control the magic and wield it to such strengths it was crazy sometimes. The Shadowmounts were known for their mages, they have the best mages in history, but they were also known for their massive connection to dark magic. Most have stayed away from the Shadowmount territory, just for the sake of the rest of the realm. Lastly the Ostywn&apos;s, they had the best swordsmen in the whole realm, the girls that have been trained there are the most merciless Venus she has ever seen. That means a lot coming from her. "What do you mean acting up my queen?" Camaeneth asked concerned. She didn&apos;t quite know all of the facts but she heard the stories that a couple of decades ago Ostwyn waged war on the Venus royal palace. The palace ended up winning but only because of the reinforcements the Valoor and Eriness had sent. From the books she had studied, Ostwyn is supposed to be a very dark and icy place. Not like Shadowmount where the queen sits upon a throne of bones. It was icy, and dark, and cold. No one liked it there except for the people who were born there, and those people usually were disturbed. She hadn&apos;t met anyone who was born in Ostwyn, but her sister had, and it seemed they were less than pleasant. "The Ostwyns have been sending over people to Shadowmount, they have also been gathering more swordsmen and sending them here. Although this is a free place, the Ostwyn may take advantage of that, their queen is one of the cruelest. But the true cruelest being the Shadowmounts queen." "You&apos;ve met them?" Eglanor asked, everyone turned their heads to him. He forgot to address the queen properly, and was getting stares that told him that he did so. He hung his head a bit before continuing. "Sorry, your highness." "It&apos;s okay Eglanor, no need to apologize. And to answer your question, yes I have. They often come for our meeting we have once a decade, it is like a reminder of the peace treaties that have been set. If the Shadowmounts and the Ostwyns were to wage war against the palace, they would destroy it." That sent shivers down not just her spine but she could tell others too. There were only a few people who had fought in a war before, like a real war, and she was not one of those people. Her sister has won battles, but not wars. She herself hadn&apos;t even won a measly battle, if war were to break out, who knows what would happen. "As you know, the Shadowmounts are a rare race, but are endowed with unimaginable connections to dark magic. Their mages are some of the best, and the worst mages around. There is a reason their queen sits on a throne of bones, its to place fear in her visitors hearts." That freaked her out, a throne of bones. The bones of the woman&apos;s enemies? Of her comrades that disagreed with her? She&apos;d heard the worst stories, and never wanted to meet this queen. "I think we may need to have another royal meeting, and the fact of the matter is, if we don&apos;t and war does break out, the Ostwyn race may need to be wiped out." Wiped out. Did the queen know how many Venus that would be, the battle field would be soaked in blood. Blood of Venus, even though they were a different race, they were still part of the Venus species. That was no way to treat others, even if they have done despicable things. "My queen, I don&apos;t think wiping out the race is right. We need to get that meeting together, please, war would not be good for anyone," she intervened. The queen looked at her and gave a small smile closing her eyes. "War would not be good, I can see the outcome already. But, the queens, they are hard to convince to come. The queens of Valoor and Eriness may come, but trust me when I say this, no way in all the realms will the queens of Ostwyn and Shadowmount agree to the meeting." "There has to be a way to convince them your highness, even if someone has to go there and bring them back with them!" she was shouting now, which did not boat well for any captain. You never shouted at the queen, ever. "I&apos;m sorry for yelling my queen." "Someone will go there." What? She was trying to make a statement not ask the queen to send some poor soul into the most deadly territories in Venus. Who would she send? She hoped it would not be her sister. "Yes, someone will go there, and bring back the queens. Even if they fight their way through and have to bring the queens by force, its better than war." "My queen, who will go?" "Why you of course Meathil, and your bracket." Her! Going to the... the... darkest kingdoms in Venus. To get the queens that sat on thrones of ashes and bones. "You did suggest it so you will leave in five days, be sure to get packed and ready. I will be sending your sister to the Valoor and Eriness territories, but I will be placing one of her informants with you since you only have nine members in total." "You will go to Ostwyn and Shadowmount Meathil, end of story. Now, meeting dismissed."